In 1886, as Gauguin was moving away from Impressionism in his search for a simplified, synthetic style of primitivist inspiration, he met the ceramicist Ernest Chaplet (1835-1909) and worked with him in his studio, learning the techniques of the craft. Between 1893 and 1895, during a visit to France after his first stay in Tahiti, Gauguin spent a further period of intense experimentation in Chaplet's studio. This piece dates from that time. Another version of it, known as The Tahitian Woman, is in the Musée d'Art Moderne, Geneva. Most characteristic of Gauguin's interest in ceramics are these vases in the form of a human head, together with his famous and disturbing self-portraits as a mug or a tobacco jar of the years 1889-90. In pieces of this kind, influences of the most varied ethnic origins are merged together. 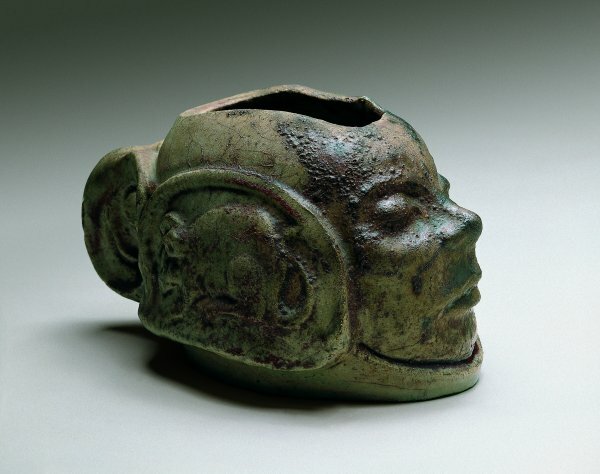 Of these, the most important is the anthropomorphic pottery so common in pre-Colombian art, for example, in the cultures of ancient Peru, such as the Nazca or the Mochica. It must not be forgotten that Gauguin felt very proud of his Peruvian ancestors and used to recall his childhood in that country with nostalgia. Secondly, this young girl's head, with its closed, bulging eyes, also recalls the over-modelled human skulls of various Oceanic cultures. In particular, the irregular outline of the opening suggests a broken skull, perhaps a reference to cannibalistic practices. Whatever the case, the piece is presented as a kind of ceremonial bowl that embodies the spirit of an ancestor or a god. The coils of hair on the two sides of the head are adorned with the figures of a dog and a mouse. Although their symbolic meaning is obscure, these two animals appear in medieval iconography as familiars of the devil. Perhaps, once again, Gauguin associated the female figure with a malign, supernatural presence and a temptress.